Scrutiny can generate and ftp an XML sitemap conforming to the standard protocol for submission to search engines. This information ensures that they know about all of your pages. Each of your pages is contained in the sitemap unless it contains the robots noindex meta tag or is excluded by a robots.txt file and you have switched this option on in Scrutiny's preferences (Scrutiny>Preferences>Sitemap). For each page, the file contains a change frequency and a priority. This information tells the search engine about the priority that you give to your page and how often you are likely to update it. They may or may not act on this information. If present, priority must be a value beetween 0.0 and 1.0. I suggest that you mark your home page as 1.0, one important page as 0.9, slightly less important pages as 0.5 and then decreasing from there. 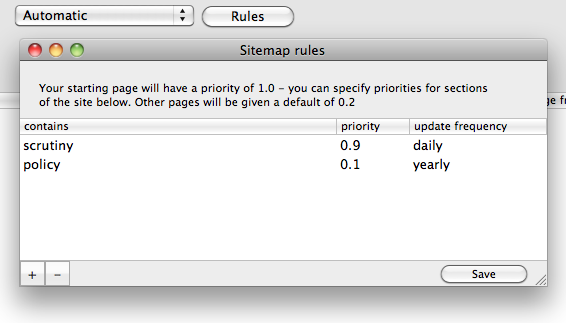 Further to this, you can set up some 'rules' to specify priority and update frequency for certain pages or sections of your site. You don't need to enter a full url - like the black and white lists on the front settings screen, you only need to enter a partial url. This way it is possible to specify a particular url or a section of the site, eg "/engineering/"
In Preferences > Sitemap you can choose whether the exported file is saved locally, saved and then ftp'd or just ftp'd. Scrutiny can export your sitemap as a .dot file which can be opened by graphing applications such as Omnigraffle. These images are fun and can also be useful for spotting pages which are 'out on a limb' or not very well connected. You are viewing part of the manual / help for Integrity and Scrutiny for Mac OSX by Peacockmedia.